For decades it has been the Gerbing mission to warm those who were cold whilst in pursuit of outdoor fun. From the most ardent of winter explorers, to military contracts, and numerous motorcyclists as they thunder down the chilly roads, Gerbing technology has been honed for one specific purpose, and they have been honed well. Though they are coming to the Fall 2015 table with a new, slightly more robust name, the commitment to heat has not changed. The new Gyde by Gerbing 12V EX Pro Jacket resides high up the mountain of heated gear. Only the most adventurous motorcyclists, or those who simply like to know that they can be if they need to, need to apply here. This genuine Cordura 500 Denier outer shell is reinforced with ripstop material in all of the impact areas as well as an Aquatex breathable waterproof G-Liner membrane with a water repellent (DWR) finish. It also comes with Knox CE approved armor at the elbows, shoulders, and even a CE Level 1 back protector. 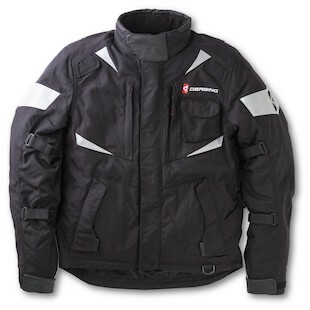 The combination of moto-specific defenses, and seven Microwire heating zones throughout the torso, collar, and sleeves make this a formidable opponent for even the coldest of days and longest of rides. To compliment the 12V EX Pro jacket, or simply as a stand-alone option itself, the Gyde by Gerbing 12V EX Pro Pants are a podium-topping choice. 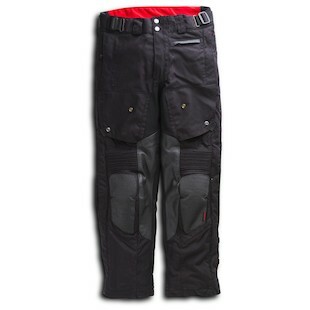 Constructed of the same outer shell materials as the jacket, the 12V EX Pro pants rock height-adjustable Knox CE armor at the knees for added impact protection, along with Superfabric panels for abrasion resistance. The heating zones in the EX Pro pants from Gyde are located throughout the legs and hips and allow for instant warmth at the touch of a button. The 12V EX Pro series from Gyde by Gerbing are truly giants in the heated motorcycle gear world. While they may be overkill for the short-distance commuter or rider who is just hoppin’ around town, for the long-range, any-weather, year-round kind of motorcyclist, these should be high on your list of gear closet upgrades.